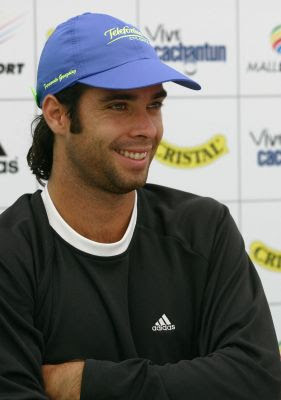 If you're a Fernando Gonzalez fan, head to Mason's Tennis Mart in Manhattan, this Saturday, on August 29, 2009 at 4.30PM as he'll be meeting fans to promote the new Babolat Pure Storm line of racquets. Gonzalez will sign autographs and free gifts will be presented to patrons who attend while supplies last. Maria Sharapova never failed to showcase her Tiffany earrings at Grand Slams. Designed by Frank Gehry, this latest sterling silver and diamond earrings were created especially for Sharapova to wear at the US Open. Tennis legend Martina Navratilova, 52, is engaged with Julia Lemigova, 36. The couple were spotted walking together in Saint-Tropez. Former world no.1, Martina Hingis, who is banned from tennis for cocaine abuse, has been revealed as a contestant in this year's BBC-produced Strictly Come Dancing. This is Hingis' second foray into British reality TV after taking part in Beat the Star earlier this year.